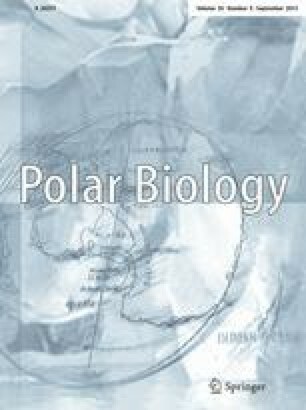 The distribution and diving behaviour of 16 adult harp seals (Pagophilus groenlandicus) from the Greenland Sea stock were studied in 1993 and 1999, using satellite-linked dive recorders (SDRs). The seals remained near the pack-ice edge in the Greenland Sea between breeding and moulting (April/May 1993; 6F) and during the first 7 weeks after moulting (June/July, 1999; 4F, 6M), there diving to depths of <100 m. In mid-July 1999, seven out of eight seals with active SDRs migrated into the Barents Sea, there diving to <400 m and sharing feeding grounds with the Barents Sea harp seal stock. Between September and December, six of these seals joined the eighth seal in the Denmark Strait until March 2000, there diving to depths of 100–400 m. Overall, dives were significantly deeper in the day and in winter than at night and in summer, with some regional differences. Harp seals are considered pack-ice-associated seals, but our tagged seals spent a considerable proportion of their time in open water, their distribution largely overlapping with that of capelin (Mallotus villosus). The authors thank Professor Lars Walløe, University of Oslo, for assistance in connection with statistical analyses, and the crews of HMS “Senja” and R/V “Jan Mayen” for their help in the field. We are also grateful to Dr. Hjalmar Vilhjálmsson, Marine Research Institute, Iceland, for sharing his expertise on the biology of Icelandic capelin stocks with us. This study was financed by the Norwegian Research Council, grants nos. 408.004, 408.006, 408.008 and 408.016.